Welcome to your Prospect Tower corner unit studio! Available on or about April 15th. Enjoy garden views on this corner studio with double exposures, west and south. 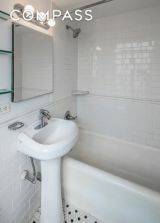 The windowed bathroom features white subway tiling and a pedestal sink. The kitchen features a ceramic cook top, microwave oven, white tiled backslash, and updated cabinets. Lease term minimum is one year, no pets, basic financial parameters apply. The building features a full time doorman, laundry room, roof deck, and access to a fitness center at 5 Tudor City Pl.